Abuse of synthetic cathinones, popularized as “bath salts,” has increased dramatically in the USA since their debut in 2010. Preclinical behavioral studies may clarify determinants of the abuse-related effects produced by these compounds. 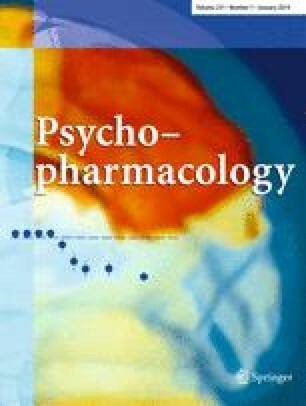 This study examined behavioral effects of (±)-methcathinone, (±)-3,4-methylenedioxypyrovalerone (MDPV), (±)-3,4-methylenedioxymethcathinone (methylone), and (±)-4-methylmethcathinone (mephedrone) in rats using intracranial self-stimulation (ICSS). Male Sprague–Dawley rats (n = 18) with electrodes targeting the medial forebrain bundle responded for multiple frequencies of brain stimulation and were tested in two phases. First, dose–effect curves for methcathinone (0.1–1.0 mg/kg), MDPV (0.32–3.2 mg/kg), methylone (1.0–10 mg/kg), and mephedrone (1.0–10 mg/kg) were determined. Second, time courses were determined for effects produced by the highest dose of each compound. Methcathinone produced dose- and time-dependent facilitation of ICSS. MDPV, methylone, and mephedrone produced dose- and time-dependent increases in low rates of ICSS maintained by low brain stimulation frequencies, but also produced abuse-limiting depression of high ICSS rates maintained by high brain stimulation frequencies. Efficacies to facilitate ICSS were methcathinone ≥ MDPV ≥ methylone > mephedrone. Methcathinone was the most potent compound, and MDPV was the longest acting compound. All compounds facilitated ICSS at some doses and pretreatment times, which is consistent with abuse liability for each of these compounds. However, efficacies of compounds to facilitate ICSS varied, with methcathinone displaying the highest efficacy and mephedrone displaying the lowest efficacy to facilitate ICSS. This research was supported by the National Institutes of Health grants R01 DA033930 and R01 DA026946.